Ireland has a vast profusion of natural lakes, which together account for about 2% of the country’s surface area. Close to 6,000 of these lakes are over over 1 ha, with the majority found in the midlands, west and northwest of the country; 18 exceed 1,000 ha. The largest are Corrib at around 17,000 ha, Derg at 11,600, Ree at 10,500 and Mask at 8,300. This plethora of stillwaters is due to a combination of high rainfall, geomorphology, and the underlying geology, with most lakes forming as a result of glacial action during the last ice age. The River Shannon system contains many of Ireland’s lakes and forms the central spine of Irish inland waters. The great western lakes of Corrib, Mask, Carra, Conn and Cullin in Counties Galway and Mayo also stand out as major aquatic ecosystems. More on Ireland’s iconic lakes can be viewed here. Ireland’s lakes are as diverse as they are numerous. There are turloughs (seasonal lakes on limestone bedrock which disappear in summer), mountain tarns, deep lakes (Lough Mask is c. 60 metres at its deepest), shallow lakes and everything in between. The majority occur over limestone bedrock and are naturally either oligotrophic or mesotrophic, with corresponding ecologies. Lakebeds vary from fine silt to large boulders or bare rock, and include some which are characterised by the formation of a fine calcium carbonate deposit known as marl. Aquatic vegetation is also highly variable according to the ecological characteristics of the lake, and may include fringes of common reed (Phragmites australis), submerged macrophytes such as pondweeds (Potamogeton spp.) and stoneworts (Chara spp. ), and floating-leaved water lilies. Many Irish lakes host important populations of fauna, including mammals (otter Lutra lutra), birds like gulls, waders and waterfowl, fish (among them rare and endangered species such as the arctic char Salvelinus alpinus and the pollan Coregonus autumnalis), and invertebrates. The salmonid fish populations of many lakes are also recognised as important at the European level. The social and economic value of Ireland’s lakes is extremely high. Firstly, many of them provide important supplies of water for domestic, industrial and agricultural purposes. Secondly, they provide a wide range of recreational and leisure opportunities and facilities (angling, boating, swimming and birdwatching among the former). Thirdly, they are invaluable as sources of educational material. Finally, there is also their value in the provision of less obvious ecosystem services, such as the reduction of flood severity. 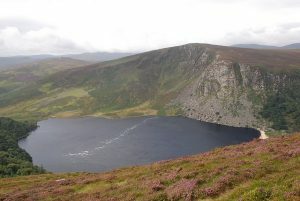 However, Ireland’s lakes have come under increasing ecological pressure from a variety of threats, foremost of which is that of eutrophication (nutrient enrichment) deriving primarily from agricultural runoff, but also from effluent produced by wastewater treatment plants, forestry practices and the overgrazing of uplands. Many lakes are also polluted to varying degrees by chemicals discharged from various human activities. Abstraction of water for human use is a problem facing some lakes, and is likely to worsen as the effects of climate change modify rainfall patterns. A major and increasingly serious threat comes from the introduction of non-native species of plants and animals. Many of these exotic species cause little harm to overall ecology, but some are aggressively invasive and do pose a serious threat. These include the zebra mussel Dreissena polymorpha, the curly-leaved pondweed Lagarosiphon major, the American mink Mustela vison and several species of fish.